If you have taken even a casual interest in mountain bikes over the past few years, you have probably heard of the trend to a bigger wheel size, the 29er. Extolled by many and detracted by a few, the verdict is now clear: Mountain bikes with 29-inch wheels are here to stay. Better momentum once rolling, meaning more progress for less effort and faster rolling over open terrain. A larger tire contact area on the trail, giving better traction and control when climbing or cornering. A higher “attack angle,” meaning the wheels roll over trail obstacles with less impact, reducing fatigue and smoothing out the trail. Riders report that a 29er gives a feeling of enhanced stability and control, decreasing the “sketchiness” of the riding experience. 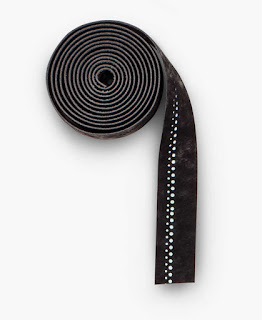 This means fewer on-trail panic attacks and more confidence and comfort. Who Can Ride a 29er? Many people can get a good fit on a 29er, but there are fewer sizing options for short riders (male or female). Why? The main issue is the standover clearance. A 29er is often taller than a comparably sized 26-inch wheel mountain bike and may be too tall for smaller riders. 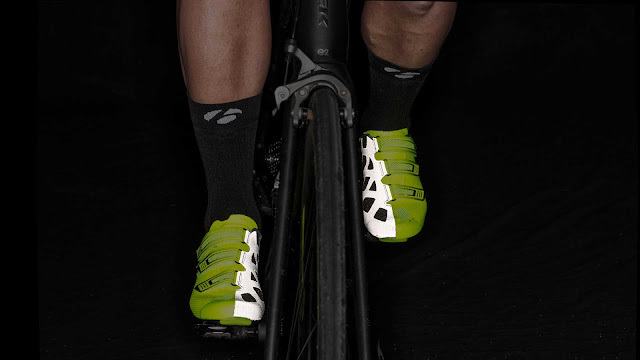 Toe overlap with the larger wheel and an incorrect handlebar height are other potential concerns for shorter riders. Many 29ers are therefore available in medium, large and extra-large frames, with small frames and women’s specific frames just starting to catch on. Choosing a 29er is the same as selecting any bike: Know your riding intentions and how you want to use the bike.Not all 29ers ride comparably. As with any category of bikes, some models are lighter, faster and nimbler than others. Some 29ers are designed for racers, others for weekend enthusiasts and still others for occasional riders who want one bike to serve a multitude of purposes. 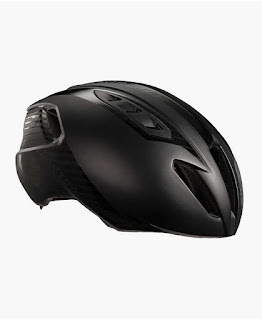 Check the product descriptions on REI.com for help with these specifics. If you are tempted to simply upgrade your existing bike, keep in mind that you would need more than bigger wheels. Unfortunately, 26-inch wheels and 29-inch wheels are not interchangeable on a frame, since frames and suspension are designed to accommodate a specific wheel size. It’s best to discuss brand and model options with a knowledgeable sales specialist (at REI or other specialty bike shops) to get an understanding of the relationship between bike quality, performance and price. Narrow your selection to 2 or 3 models and be sure to take a test ride to find out which one feels right. At a price that many deem to be the entry into a bike worthy of off-road abuse, the Marlin 7 sits in a highly competitive market segment. Where the now more expensive X-Caliber once held this price point for Trek, it’s the Marlin that steps up to the plate. 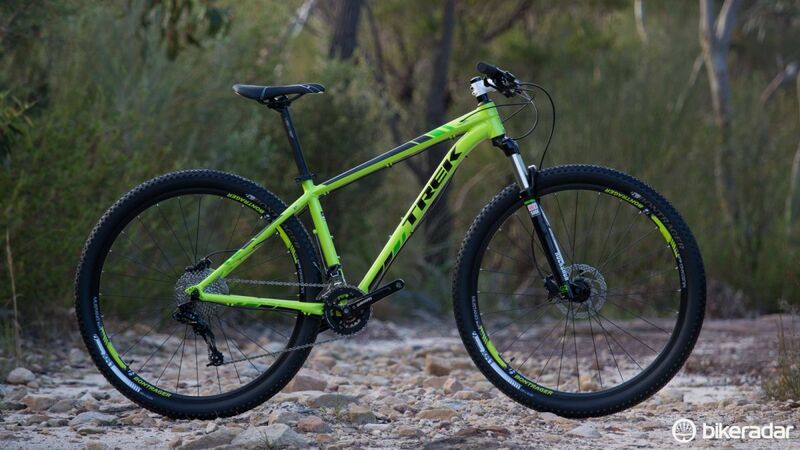 Trek is no stranger to the 29er-wheeled mountain bike, with its now-discontinued Gary Fisher brand effectively creating the 29er market as early as 2001. Eventually these bikes morphed into the Trek’s we see today, but not before the Gary Fisher brand had arguably perfected the geometry of the big wheel frames, well before many other top brands had looked beyond the tried-and-true 26in wheels. Made of Trek’s self-branded ‘Alpha Silver’ aluminium, the Marlin offers a relatively basic, yet perfectly solid frame as the bike’s foundation. The frame features are kept simple with only subtle shaping to the tubes to give them additional strength, simple pannier and fender mounts and a classy coat of paint (three colours to choose from). Being simple in features doesn’t mean this frame is lacking in quality though. All the welds are consistent, the alignment is spot on and the oversized shapes provide for plenty of stiffness and strength. Frame construction and materials aside, it’s the angles and dimensions that have the biggest affect on the trail. As mentioned previously, Trek has had longer than just about any other brand to dial in its geometry for use with 29er wheels, and the Marlin offers geometry quite near to its more expensive siblings. Known as ‘G2’ geometry, Trek claim that its 29er-specific designs create a more natural and reactive handling characteristic. 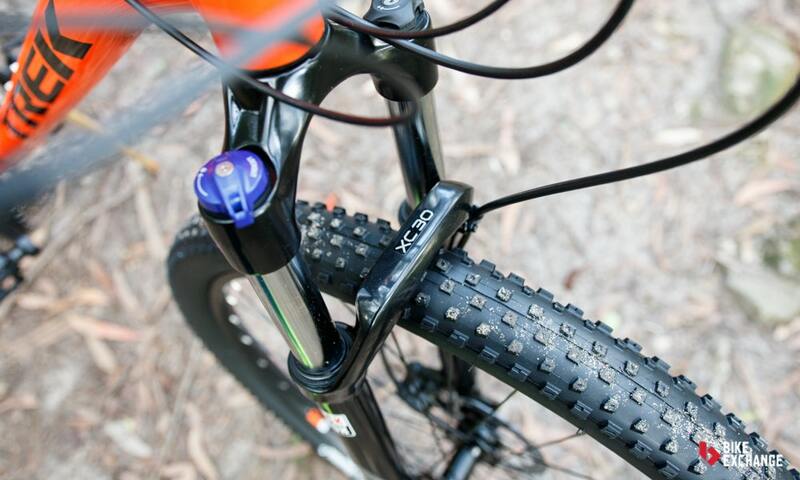 A large part of this starts at the fork offset, where the wheel sits some 5mm further in front compared to many other 29er-equipped mountain bikes. 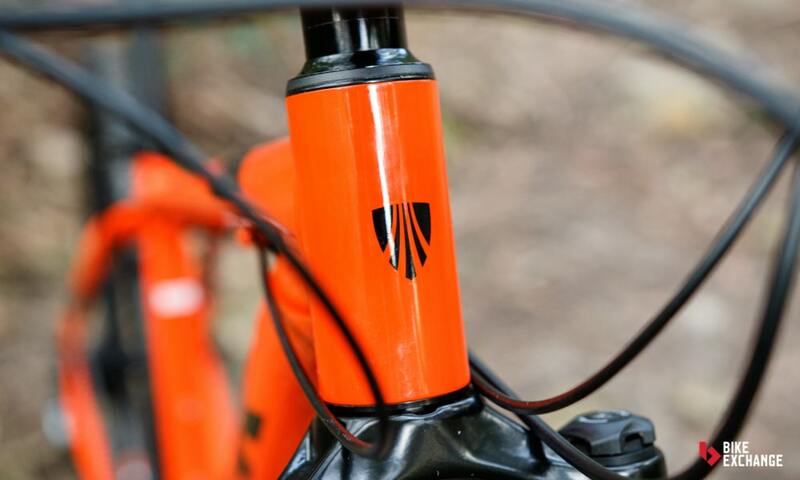 First found on the Gary Fisher bikes, this longer offset fork was once specific to Trek, but is now widely adopted by others. By offsetting the wheel forward, the handling becomes more reactive. 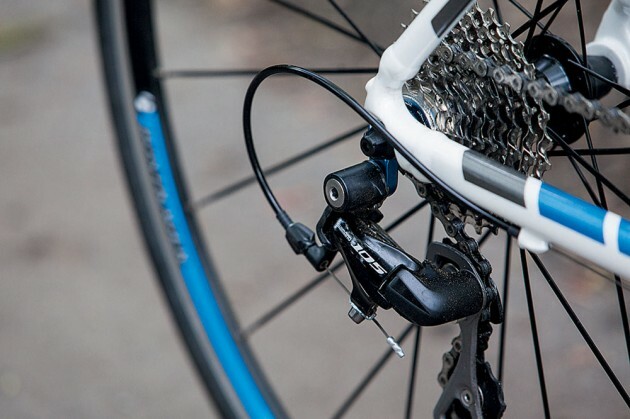 Other brands achieve this quicker handling by steepening the steering angle (head tube angle), but this often creates a nervous and ‘twitchy’ ride characteristic. 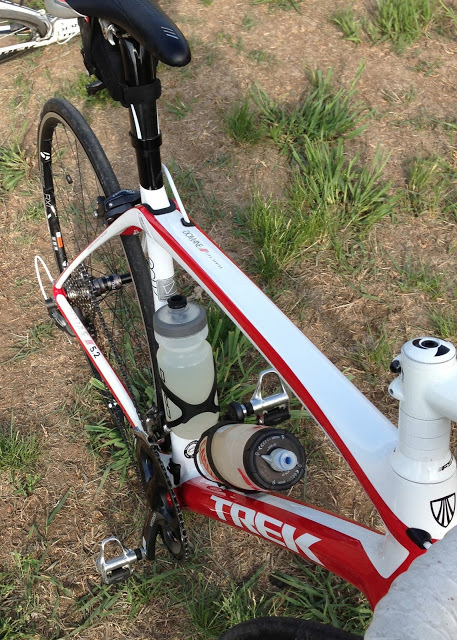 By contrast, the Trek uses a slacker head angle for descending stability, while handling is kept responsive. This special offset fork remains a rarity on bikes of the Marlin’s price and makes a true difference to how the bike behaves off-road. Further to this, the Marlin offers a modern longer length across its top tube. This is combined with a shorter stem to provide roomy reach to the handlebar, while helping to keep your weight well centred between the wheels. A quick glance of the specification list and reality of this pricepoint sets in. The Marlin 7 features a mix of big-brand components, but many of which are fairly basic. After the frame, the front suspension is the most important component. 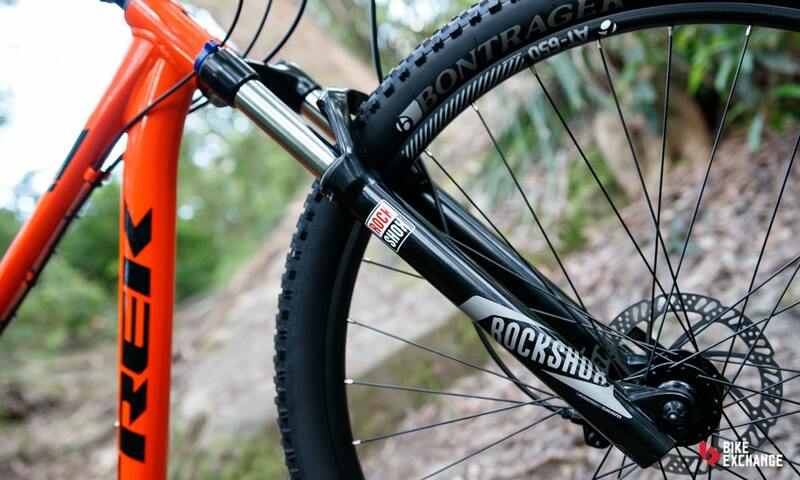 The RockShox suspension fork up front is a key feature to this bike, with the sticker alone adding some prestige. Regardless of the label, this is still a basic fork with a simple lockout on one side and control of the preload on the fork’s spring at the other side. 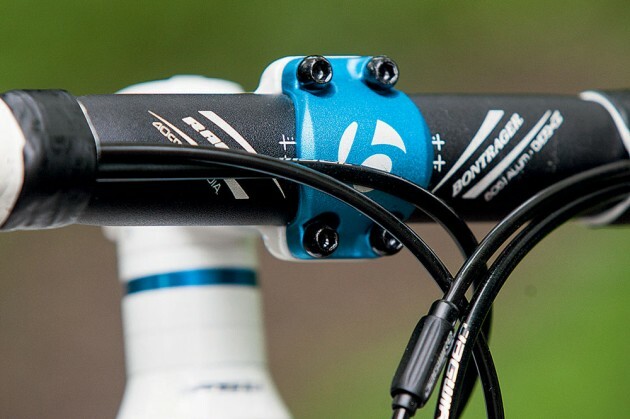 While it is hydraulic damped, it doesn’t offer the external rebound control that some bikes of this price are starting to offer – a function that controls how fast the fork returns to its full height once compressed. It’s a feature found on the X-Caliber model above. Another aspect to consider with suspension forks is the stanchion tube diameter. Simply put, the larger tube diameter will typically result in a stiffer fork that lets the front wheel go where the handlebars point. 32 or 34mm forks dominate the premium hardtail and dual suspension mountain bike market these days. 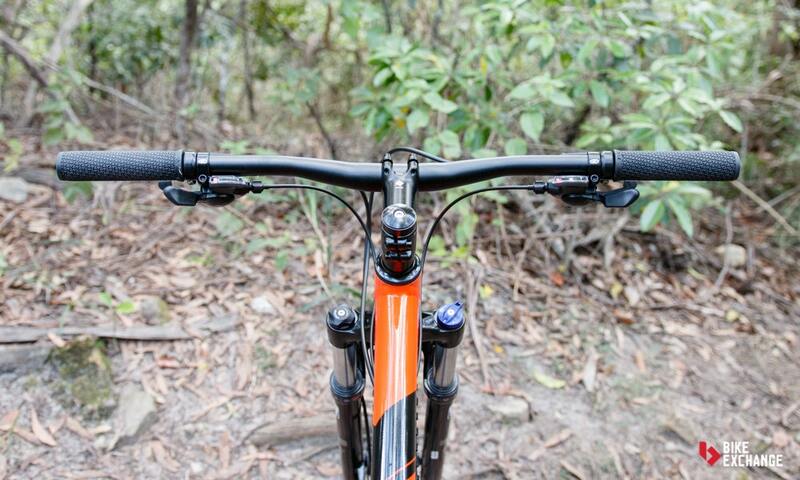 The Marlin’s ’XC30’ gets its name from the 30mm stanchions, a skinny size that is near standard on bikes of this price. 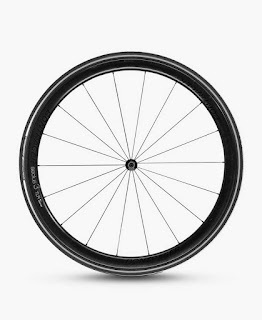 Next inline of importance are the wheels, with Trek’s own component brand ‘Bontrager’ featuring at the double-walled rims. While they’re built tough for abuse, these fairly no-frills wheels hold plenty of weight within them. It wouldn’t be a review if we didn’t nitpick, and with that, the Formula rear hub on our sample was a little noisy straight out of the box. The noise didn’t affect its function, but we decided to open it up and silence it (it helped a bit) with fresh grease anyway – a procedure best left to your shop as it requires a handful of bike-specific tools and a little knowledge. Wrapping the wheels are a pair of Bontrager XR2 wire bead tyres. 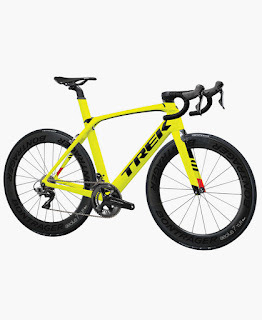 What’s interesting is that Trek have equipped a wider 2.2in model to the front wheel, with a narrower 2.0in version out back. 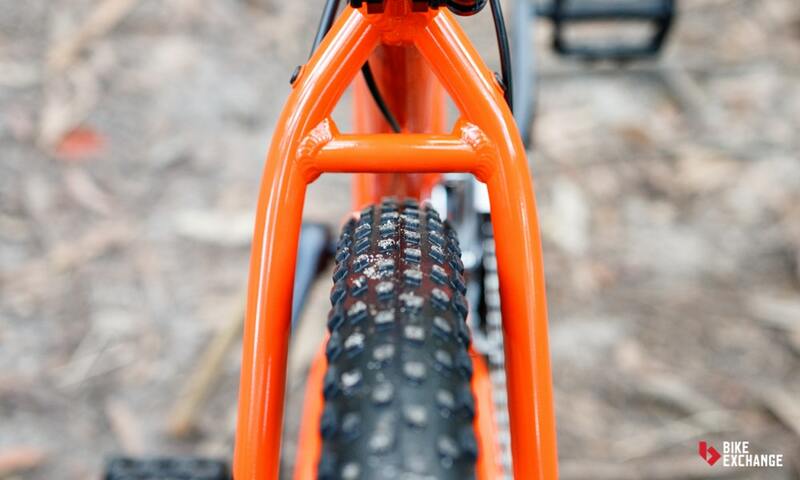 This is a popular practice on mountain bikes, where the lead front tyre offers greater control and grip, with the following back tyre saving weight. 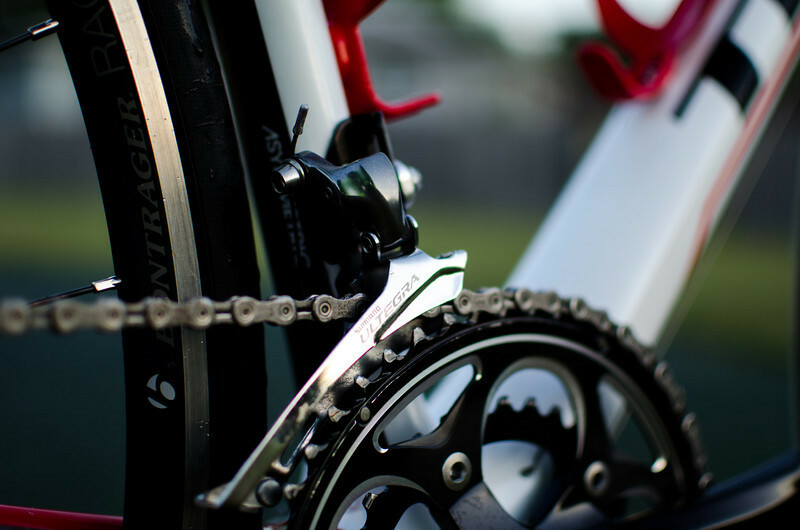 It’s the gears of the bike that most will compare models with. 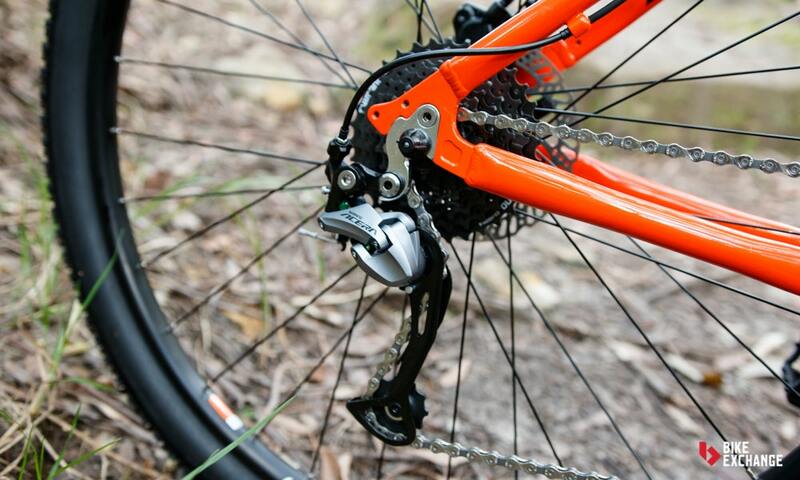 In reality, the functional difference between Shimano Altus and Acera is marginal and so the model of derailleur or shifter shouldn’t be a deciding factor for your new bike. In the Marlin’s case, the gears equipped work exactly as required and it’s nice to see all but the chain being from Shimano’s catalogue. Here, three cogs at the front match with nine at back to make a 27-speed drivetrain with huge range. Component lists aside, what matters most is how it feels on the trail, and the Marlin steers with similar poise to its more expensive X-Caliber, Superfly and even Pro-Caliber siblings. 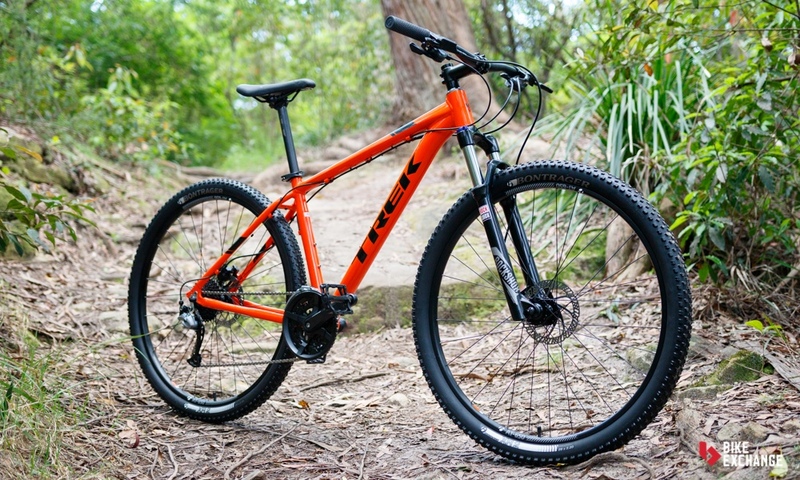 It’s off-road that the subtle differences in Trek’s geometry really shine and almost immediately we felt confident bombing down descents on this entry-level ride. Up front, the RockShox fork feels well controlled and does a decent job absorbing bigger hits, while keeping front wheel traction. Fast, repetitive trail bumps can quickly overwhelm the fork, but it’s well mannered in most conditions. To our surprise, we didn’t miss the lack of rebound adjustment as much as first thought, mostly due to the stock setting offering decent control and preventing this fork from springing back with aggression. Handling is inline with what we’ve come to expect of a modern 29er, where even the tightest of singletrack corners are no struggle to get through. Ride the Marlin hard enough and you’ll feel the flexible fork complain, with the bike understeering to the demand given. Though its hardly something to worry about, as just about all bikes of the price will suffer such a fate. The Bontrager tyres offer decent traction in a variety of conditions and the larger volume at the front is a nice touch, but if you were looking to drop this bike’s weight below 14kgs, new rubber should be your first point of action. However, it’s not all perfect. 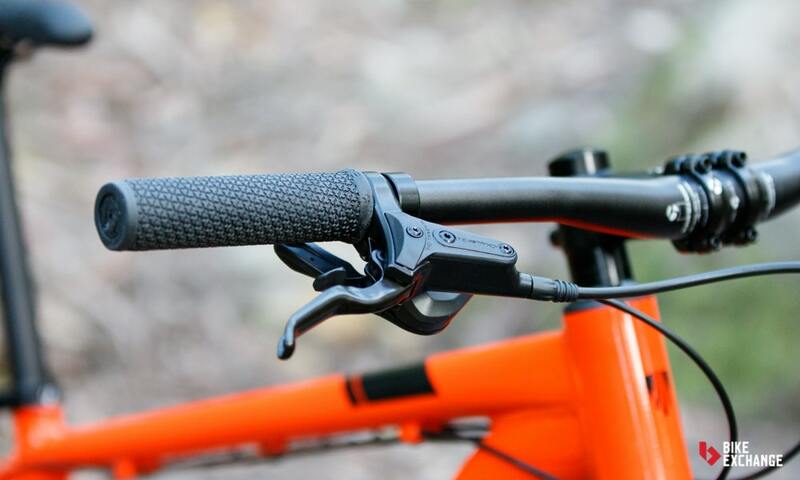 The rubber grips slowly turn on the bars and so would be the first part we’d suggest changing for the keen mountain bikers. 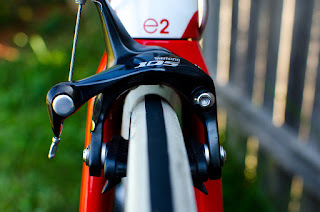 Likewise for the included plastic pedals which lack grip when wet, either changing to a metal version or a clipless pedal would be a great upgrade. On that point, it’s commonly said that 29er mountain bikes make for great all-round bikes and commuters as the rim size is equal to what 700c road bikes use. 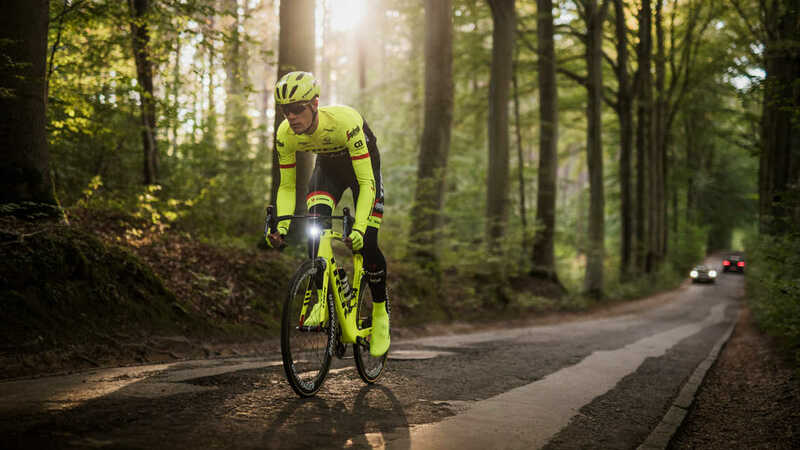 However, our opinion is that if you’re looking for a bike to solely use for commuting, without any ambition to ever go off-road, then there are better, more focused bikes to choose. Sure, the Marlin’s front fork lockout helps it on the road, but the overall weight and position is optimised for tackling off-road terrain, and it’s fairly slow and hard going when on the tarmac. While we’ve drawn plenty of similarities of the Marlin and Trek’s more expensive models, it’s important to be clear that you do get what you pay for. Yes, the Marlin offers proven geometry that serves as a strong foundation into mountain biking, but its high weight is the true limitation of the price point. If you can stretch to the X-Caliber, then the more refined frame is money well spent. Trek’s Madone 2.1 is likely to be anathema to some cyclists, a welcome entry point into the world of Madone for others. Madone series bikes are made from carbon fibre, typically expensive and usually high-performance — or that was the case, at least, until this, the Madone 2.1, came along. Thanks to advances in manufacturing techniques, you can now get the carbon bikes’ tube shape in aluminium instead. Though there may be similarities in the technology and methods used to create all the bikes in the Madone range, inevitably, given the £9k difference in price, some of the top-end model’s features have been sacrificed. 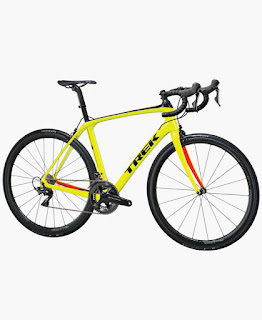 The frame is made from 200 Series Alpha aluminium, Trek’s premium road alloy, while the forks are made from carbon fibre. A running theme in the Madone range is the use of Trek’s KVF (Kammtail Virtual Foil) tube shape, a deep aerodynamic design that’s been truncated to give maximum strength for minimum weight. In the 2.1, this KVF shaping appears on the down tube and fork legs. Further stiffness is added to the frame in the head tube, where it is tapered from a 1.5in lower bearing to a 1 1/8in bearing up top, giving extra strength for negligible weight. Mudguard mounts are tucked discreetly away on the frame and fork, plus one on the back of the seat tube. As you’d hope with a bike of this price, the groupset is the very reliable and roadworthy mid-range Shimano 105 double 10-speed with internally routed cables (nice touch). Shifting is smooth and fast, and with a little maintenance the 105 should look after you for years. Where the 2.1 deviates from the norm is with its chainset, which is the Shimano R565 compact option, giving you 50-tooth and 39-tooth chainrings and a great lower set of ratios for a helping hand up the hills — but a dent in top-end speeds when hooning down them. Personally, I’d happily take the assistance uphill at the expense of a little velocity on the descents. The wheels are a straightforward set of Trek’s in-house component brand Bontrager, which feel solid and dependable once up to speed. The tyres are Bontrager R1 Hard-Case Lites, which were fine but didn’t fill me with confidence that they’d last long on the debris-strewn streets of London. The saddle is a Bontrager Affinity 1, which I would swap for something harder. 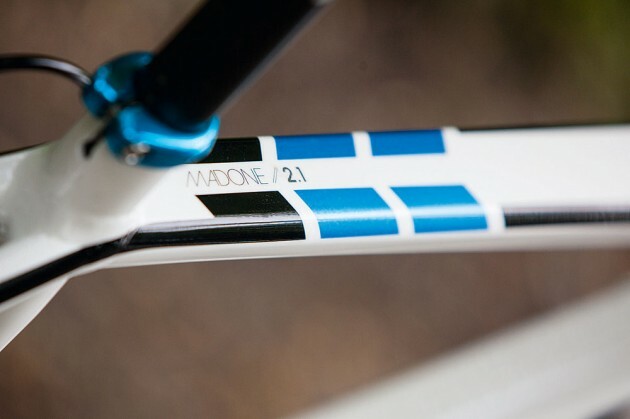 The Madone 2.1 is supplied in Trek’s H2 geometry, the middle of Trek’s three fit options. Not as aggressive as the H1, H2 has a slightly higher head tube but it by no means feels that you’re sitting upright in the wind. As a 5ft 4in woman riding the 52cm frame size, the geometry didn’t quite work for me — the bars were too wide and the reach for the brakes too far, but that can be easily adjusted. Even so, that didn’t take away from the feeling of power and strength I got from the Madone 2.1. If you can get over the fact this Madone is not made from carbon fibre, it does a good job of living up to its illustrious name — these are high-performance bikes. For the price, it’s a solid and dependable ride that’s not going to throw up any great surprises. And whether you’re commuting or on a leisurely ride, a lack of bike-related surprises is generally a good thing. Last year’s Trek Madone 3.5 took the eventual Bike of the Year 2012 victor, the Focus Izalco Pro 3.0, right to the wire, earning a runner-up spot in the process. 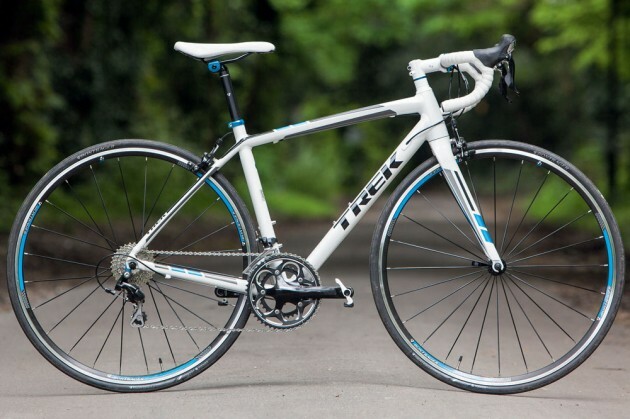 For 2013, Trek have significantly upped their game with the Madone 4.5. The 4.5 uses a significantly better grade of carbon than that of the already impressive 3.5, making it notably light at a claimed 1,100g for the frameset. 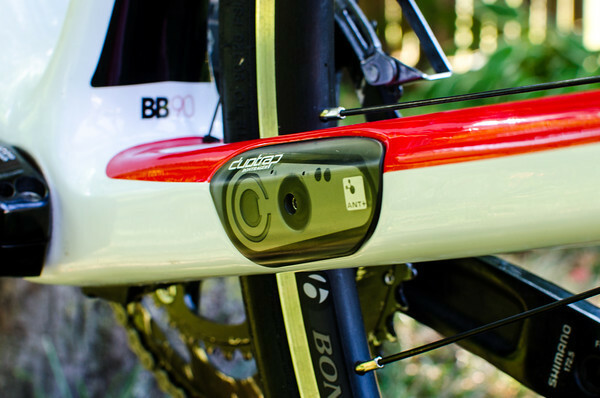 The frame itself incorporates Trek’s take on the press-fit bottom bracket BB90, for improved stiffness and less weight. 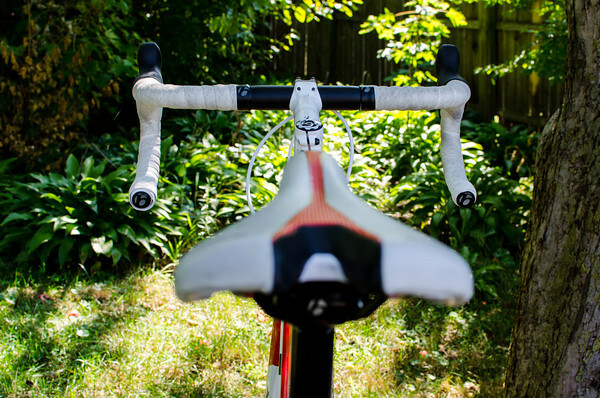 The E2 tapered head tube and highly sculpted shaping is taken from that US-built superbike, which is essentially what you’re getting with the 4.5; in terms of specification it’s a stripped-down version of their previous Grand Tour winning machine. The 5-, 6- and 7-Series bikes now have aero-optimised KVF designs, but we’re glad Trek have kept the wonderful Pro level chassis alive. A frame with design credentials this good and on a sub-£2,000 complete bike would suggest some downgrades and compromises elsewhere, but Trek have been clever with the budget. 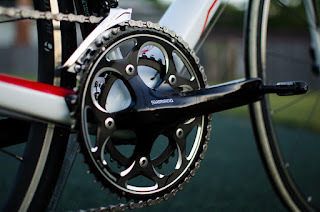 For a start, they’ve used Shimano’s Ultegra system for the mechs and shifters, only downgrading the brakes and cassette to the still-impressive 105 range, while the chainset is Shimano’s non-series R565. The wheel package hasn’t been compromised, though, as Trek’s component brand Bontrager have supplied the new-for-2013 Race wheels, featuring classy, minimal hubs with quality bearings, great seals and butted spokes. The all-new rims are also compatible with tubeless tyres. 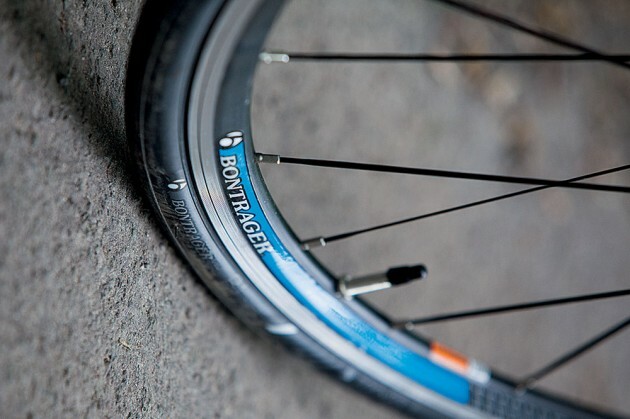 The Races are shod with Bontrager’s R1 tyres – with a nominal size of standard 23, they are in fact slightly broader than that, and in our opinion all the better for it. The difference in size allows them to be run at the lower pressures necessary for winter grip, without increasing the chances of you puncturing. 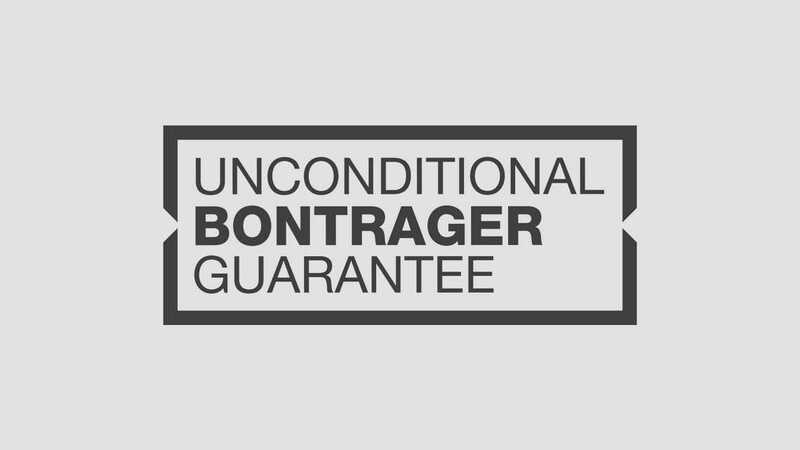 As you’d imagine, Bontrager also provide the rest of the Madone’s finishing kit. The slender, compact reach and drop VR-C bar is an adequate performer – nicely shaped with great dimensions but little to make it stand out beyond that. 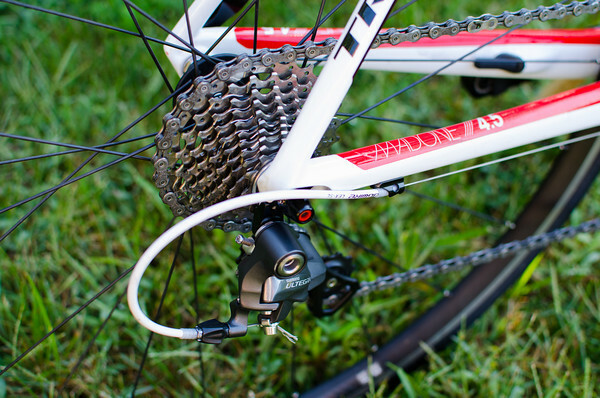 The Race Lite stem is a bit classier, and nicely finished with quality hardware. Out on the road, the class of the 4.5 is completely evident. We loved the 3.5 last year but the 4.5 takes everything that made it exceptional and turns it up to 11. The overall feel is completely smooth, and a low overall weight and broad 50/34, 11-28 gearing make the bike a complete breeze on climbs. Yet the stiffness and oh-so-sorted position make it an absolute blast down hills. Smashing the 4.5 through a succession of bends never caused it to get flustered or drift off line. 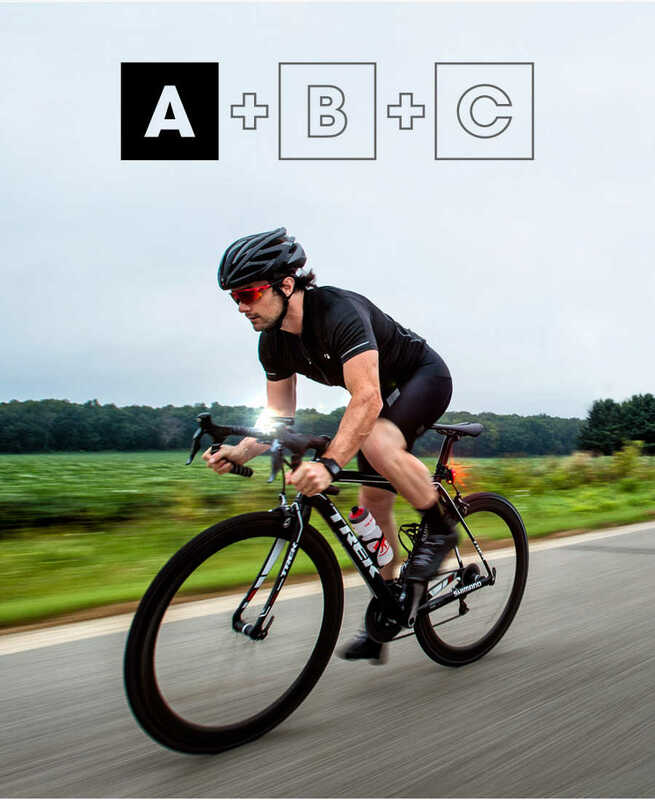 Some bikes can have snappier initial turn-in, but the 4.5 doesn’t need to be as rapid; with a bike that gives this much communication through its feel, we never found the need for last-minute direction changes mid-corner. 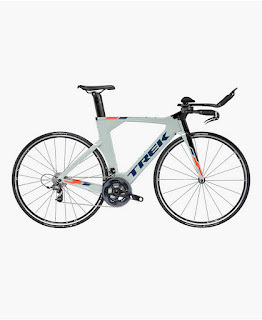 I have been wanting to get out on a Trek Domane (pronounced Do-MAH-nee) since it debuted last year. I’ve ridden a Madone 5.2 for the past three seasons and love so many things about it, but there was still a draw to the romance of a bike that was created for the cobbles of Arenberg Forest. I am not nearly as fast or as ruggedly good looking as Fabian Cancellara (if only I could pull off the hair…), but watching him hammer through the roughest sections of Paris Roubaix, while others sought shelter on the shoulder, only added to the Domane’s mystique. Okay, enough of the mushy stuff. 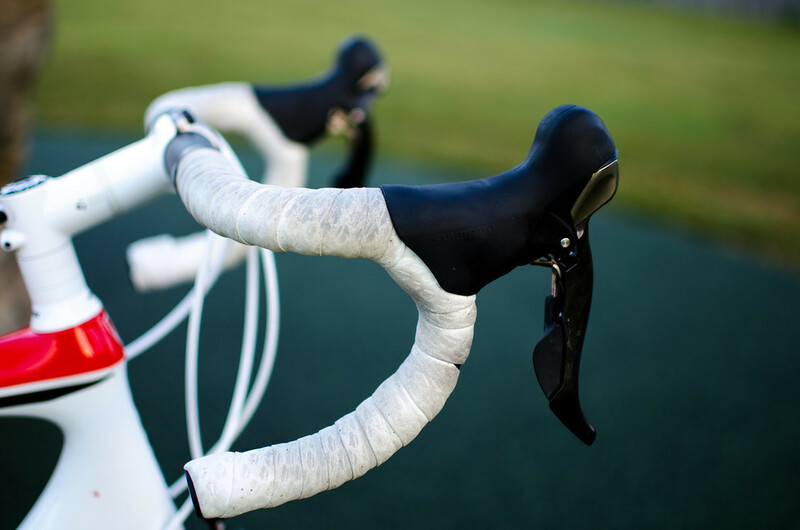 For me, the real draw of the Domane is that it’s tailor made for riders like myself – recreational endurance riders who love to tackle the club ride, a race or two and an occasional century endeavor here ore there, while remaining as comfortable and capable as possible. 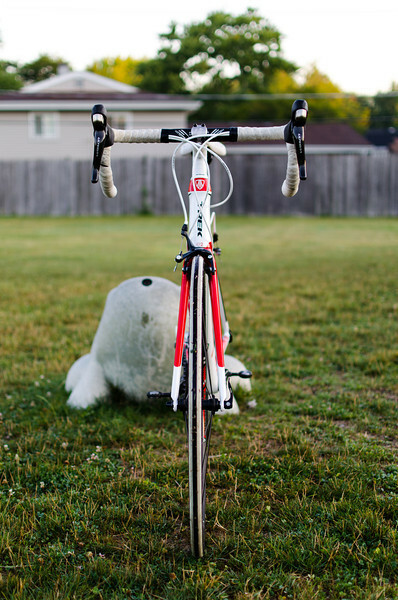 There are many bikes that fit into the Plush or Endurance category, and I believe that list is only going to grow. 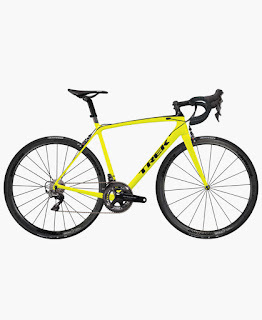 My local bike shop, the Trek Bicycle Store of Omaha, just so happened to select the Trek Domane 5.2 as it’s rental bike of the season, so I was able to call in a few favors to take one out to knock around (thanks guys). I also procured a Bontrager Race X Lite TLR wheelset for the outing. 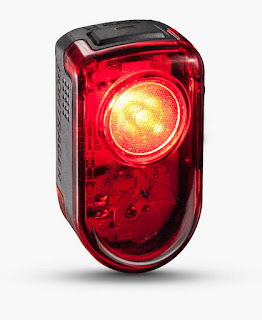 I’ll be reviewing a different Bontrager TLR set in the coming weeks, so I’ll hold on complete details until then. Truly, the only visible differences between the Madone and Domane are the Domane’s IsoSpeed Decoupler (seat tube separate from the rest of the frame), a bit taller head tube, and the swept-forward fork position. Other than that and a more squared top tube, the bikes appear very similar. As advertised, the Domane works like magic when it comes to rough surfaces and unexpected road blemishes – things that really send stress straight through my Madone frame and into my back. Bumps were dampened nearly to the point where I was able to focus less on the road and more on staying with the group. After giving this bike about all I had, I can honestly say I enjoyed riding it quite a bit. I am not going to hop online and put my Madone up for sale any time soon, but when the time comes, the Domane does seem like a great option for me. I’m not getting any younger (neither are you) and there is definitely something to be said about reducing the amount of wear and tear on your back, and your body in general, while still being able to keep up with the group – at least for most of the ride. 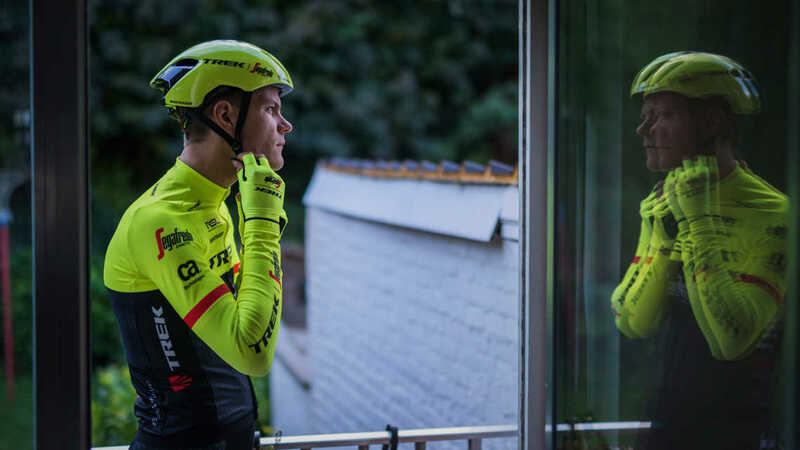 Over the last three years, Trek has conducted extensive research into on-bike visibility. We’ve partnered with a major American university to investigate what works and how we can continue to help cyclists stand out to motorists on the road. It’s all part of our ongoing campaign to make cycling safer for everyone. 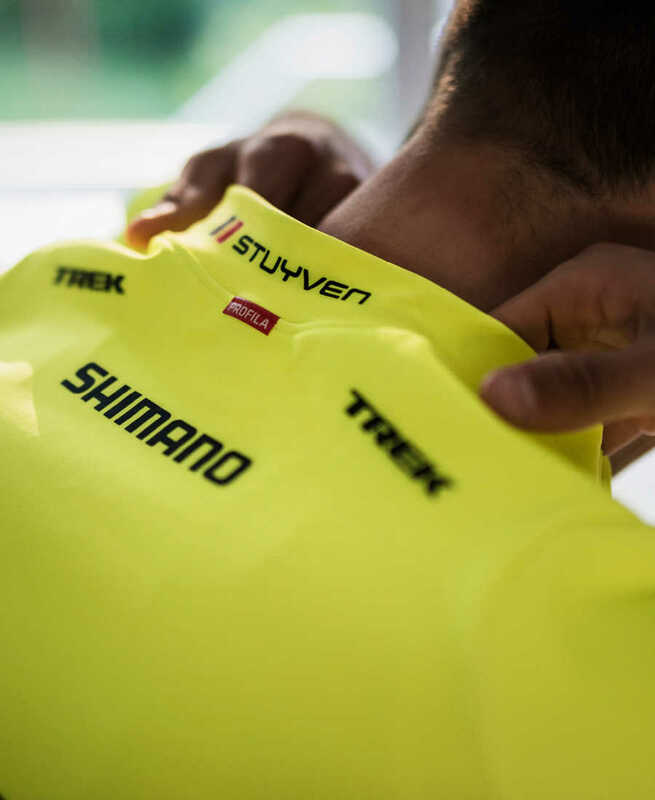 Creating safer cycling is a fundamental part of Trek’s mission. 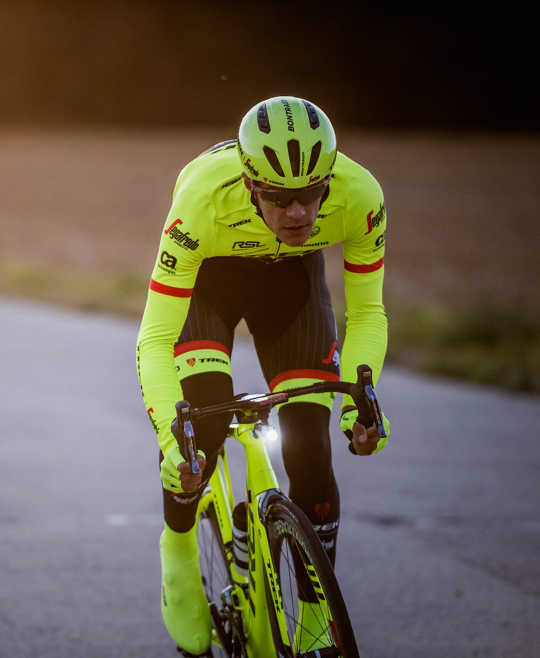 We believe it’s crucial for every cyclist to be seen, and that’s why we’ve created a full lineup of visibility apparel and equipment for riding in any season. 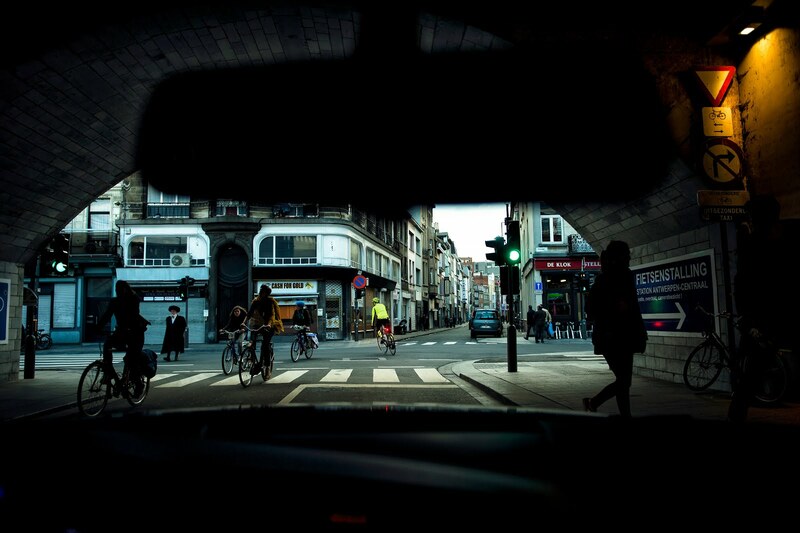 Research shows that cyclists drastically overestimate the distance at which they are detectable by motorists. Unless we’re actively doing something to increase our detectability, we may not be seen at all. And that’s an alarming reality. But there are simple steps we can all be taking to stand out. The following guidelines were developed using research conducted by students of Clemson University’s Perceptual Awareness department. 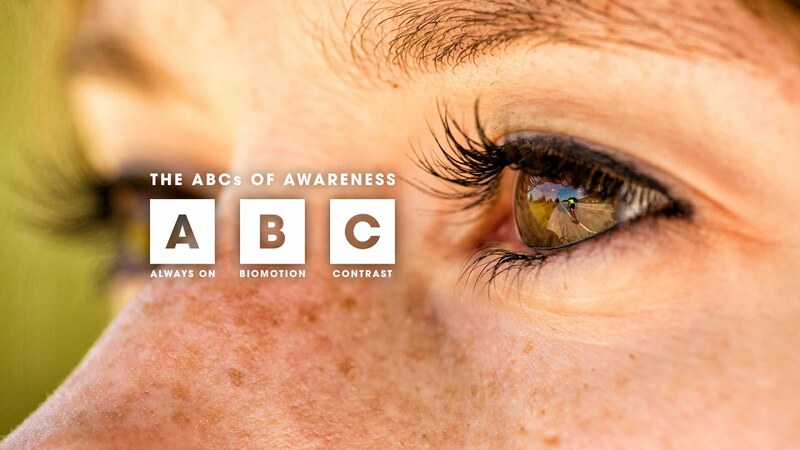 The ABCs of Awareness—Always on, Biomotion, and Contrast—are presented here in a good, better, best hierarchy. 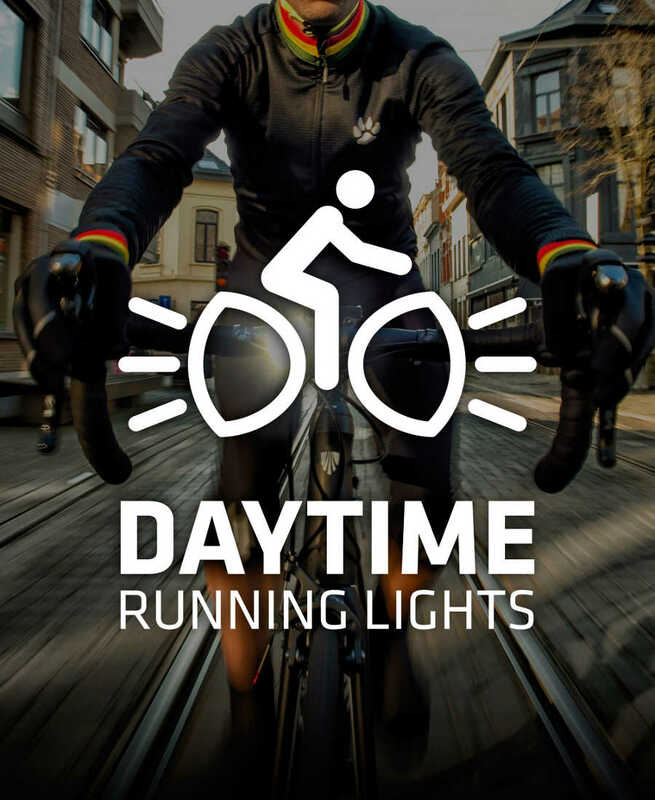 Using daytime running lights is a good way to be noticed, but a combination of daytime running lights, highlighting your body’s moving parts, and choosing gear that contrasts with the environment is the best option. 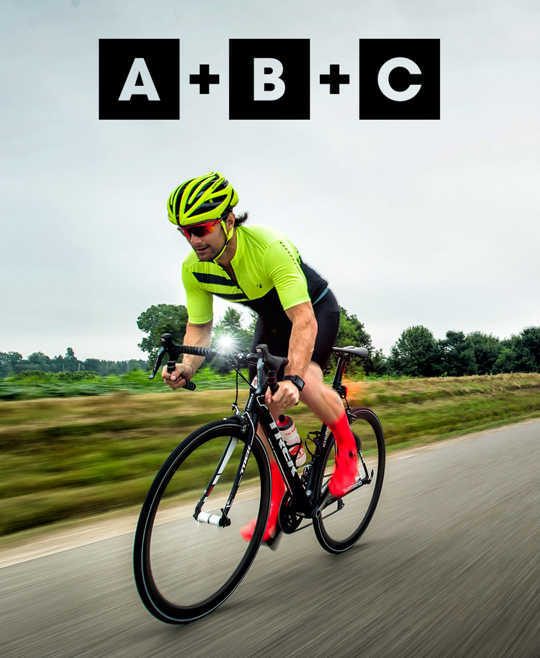 The more of the ABCs you practice on every ride, the more you’ll stand out. 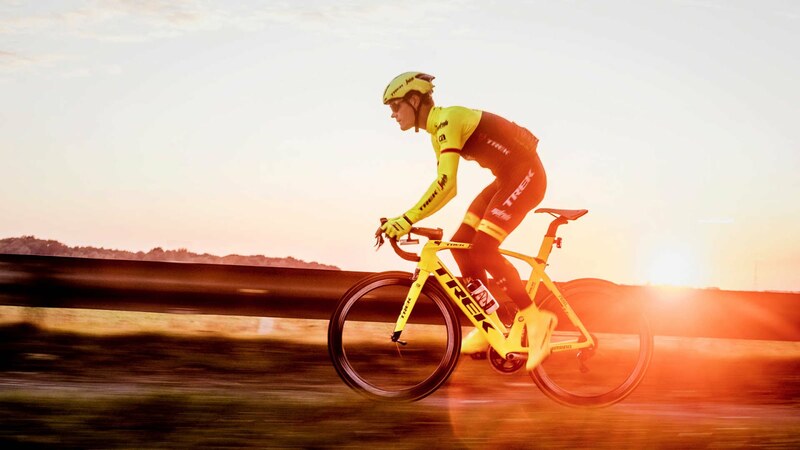 Cycling has taken some of its best cues from the automotive industry. We can thank cars and motorcycles for suspension and disc brakes, for instance. These days, cars come standard with daytime running lights because cars with DRLs are less likely to be involved in a collision. Applying that logic to bikes is a no-brainer. A true DRL has a specific focus, flash, and range. Without these three things, you just have a light. 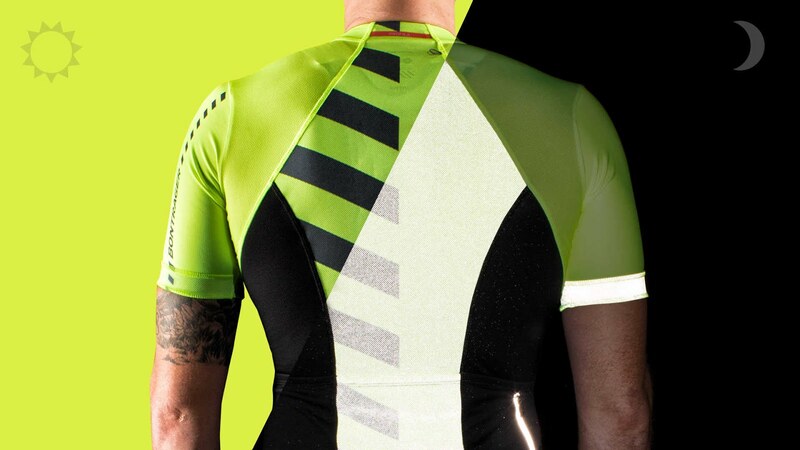 Fluorescent is effective for cyclists during daylight because it helps us stand out from the surrounding environment. 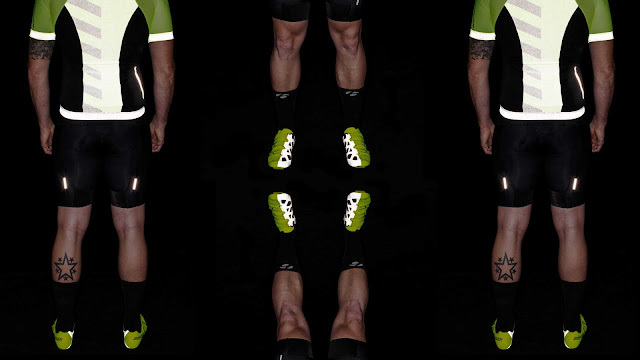 But without the sun, fluorescent apparel is no more effective than darker apparel.. The information presented throughout was curated from many sources. If you’re interested in digging deeper, check out our sources for yourself. Not just day. Not just night. Who wants to be constrained with their riding time? The distractions are real, and making others aware of your presence should be the highest priority. These day- and night-visible products will do just that. 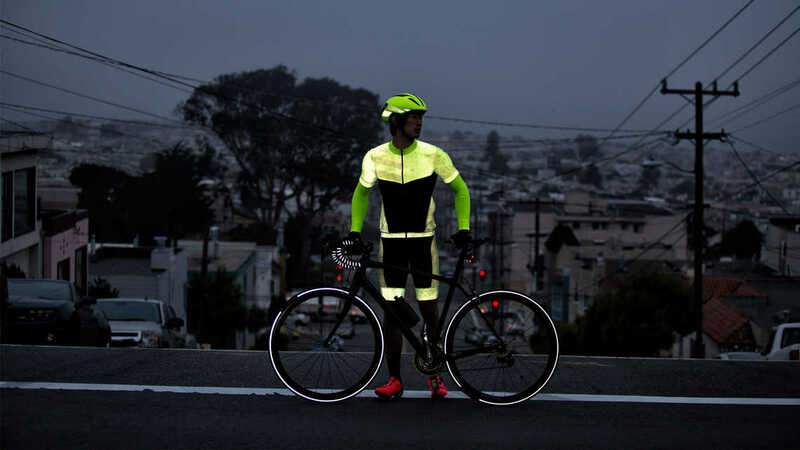 Fluorescent yellow, disruptive patterns and irregular flash patterns draw attention in the day, while integrated reflectivity and long-lasting lumen power draws attention at night. Halo is ultimate awareness, and it’s the only way to keep riding when you want, with the confidence you need. 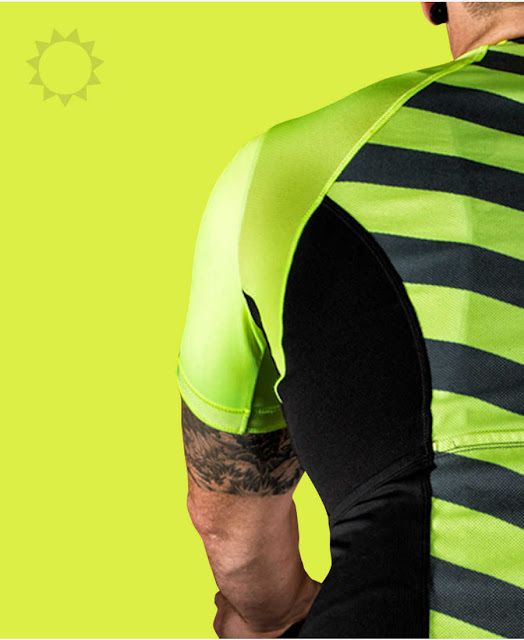 Our most visible and advanced jersey yet by way of reflective pixel technology and the unique disruptive fluorescent pattern make the Velocis halo jersey stand out. 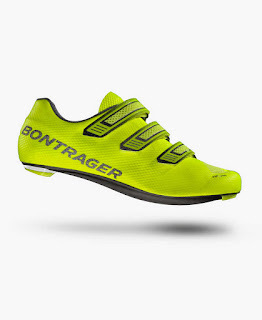 It’s a split-pattern design with fluorescent yellow on the outer half of the shoe, with a reflective inner half, giving it true 24/7 visibility. RIDE IT AND LOVE IT. IF NOT, WE’LL TAKE IT BACK. It would be unfair to say that Tim Reed won this year’s 70.3 Ironman World Championship by virtue of his sons Oscar (age 4) and Arthur (age 1) repeatedly falling ill in the weeks leading up to race day. Reedy—who outsprinted Germany’s Sebastian Kienle in a heated battle to the line after more than three and a half hours of racing—had failed to stay healthy while he and his wife Monica played nurse to their sniffling and sneezing kids. A surprise last-minute wisdom tooth extraction merely topped off his ever-changing preparation for the race in Mooloolaba, just three hours north of his home in Byron Bay, Australia. Triathlon is the ultimate endurance sport, so it may come as a surprise that Tim Reed, at 31, initially set off playing rugby and basketball. At age 18, he trained for a mere six weeks before racing his first Ironman. He ended up walking the concluding marathon. From there on he began to race here and there, now and then. The workload of professional triathletes is tremendous. Reed puts in about 23-24 hours of training every week, which he claims is considerably less than what some of his competitors do. Tim Reed has become synonymous with the Budgy Smuggler race briefs (For those in the Northern Hemisphere where the brand isn’t yet as ever-present, think of the small, brightly patterned briefs often seen in a competitive swimming environment). The family-owned brand out of Sydney has been Reed’s longest standing sponsor, and there’s no question in Tim’s mind that he’ll always race in his signature swimmers. He is quick to avow that the support of the crowds at the races is much higher when he’s smuggling his budgy, and that there’s a certain psychological side to it too. 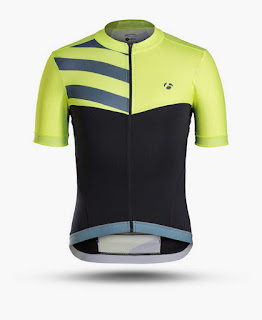 Initially though, it was all based on comfort during the race, as there are physical benefits to the briefs, including no chafe caused by rubbing and more effective ventilation. “In the end, I just love ‘em,” he says. 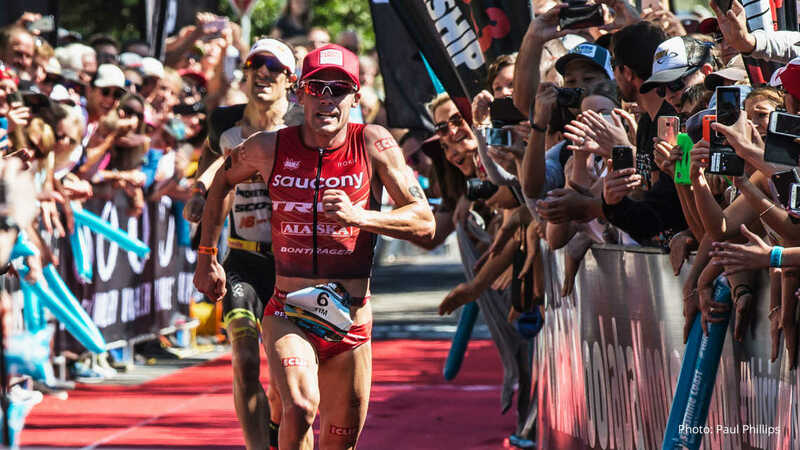 Jump back to Mooloolaba, the scene of a legendary face-off between local favorite (and budgy-smuggling) Tim Reed and Sebastian Kienle, the 2014 Ironman World Champion and 2012 and 2013 Ironman 70.3 World Champion. Reed uses the word “tenacious” to describe his rival, an athlete he respects and holds in high regard. “Sebastian never races for second,” he says. When Reed emerges from the clear blue ocean onto Mooloolaba beach, he is in a group of about a dozen athletes. Kienle is about 90 seconds behind. The bike course is technical, which is much to Reed’s liking. 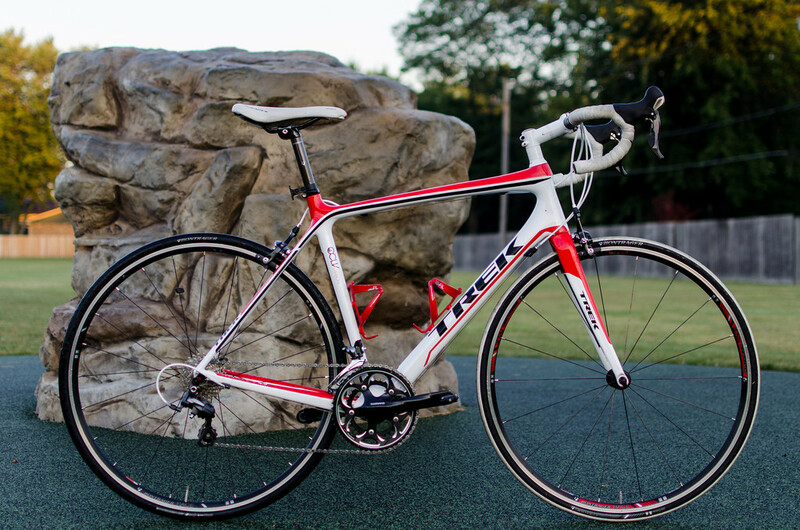 He loves the way his Trek Speed Concept handles through the corners, accelerates out of the turns, and climbs effortlessly. 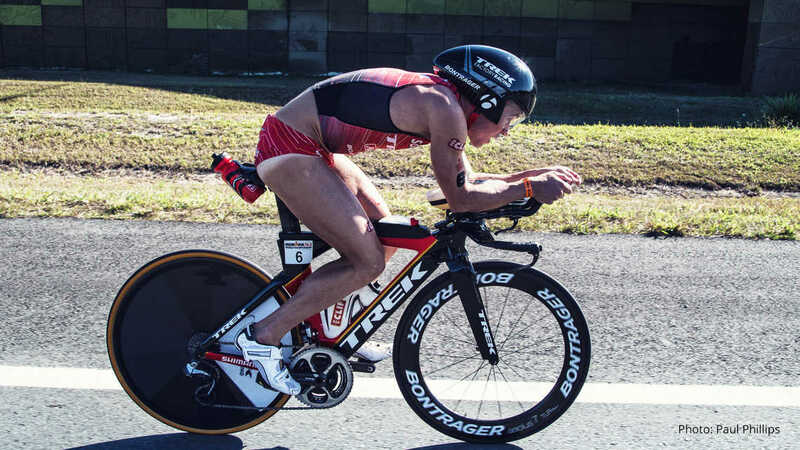 In a triathlon of this particular distance, it’s the strategy of many riders to break up the pack right away, which makes for a succession of high-power surges. At the start of the half-marathon, Reed felt strong and confident. “I generally know from my power on the bike how I’ll need to pace the run. If my power numbers are really high, I generally take the first kilometers of the run easier, to fuel up and hydrate. Reed and Kienle fought it out for over an hour, attack after attack. Faster and faster. At this level of the sport, says Reed, the difference between the top guys is ever so slight. Every athlete is in impeccable shape. It’s an athlete’s mindset that makes the difference. 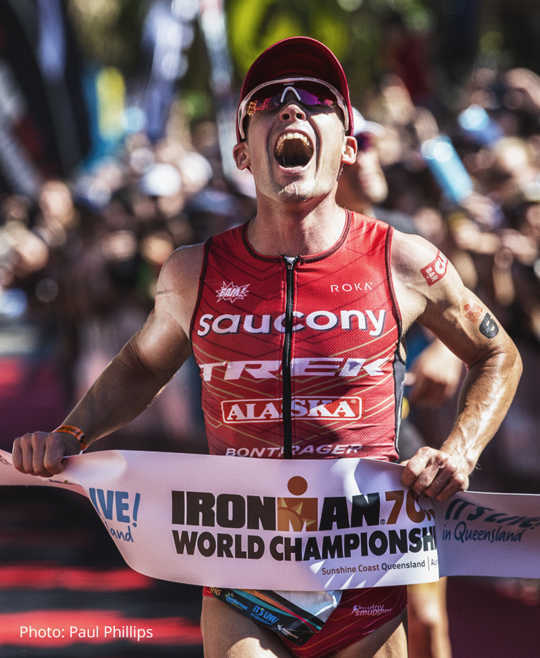 Your thirst for victory is what makes or breaks your race—especially in an Ironman 70.3 (half distance). It’s the ability to lose yourself and focus on what’s immediately around you that makes for an optimal performance—your breathing or your cadence, for example— rather than dwelling on your swim or worrying about your run. It’s about focusing on doing what you can do right there in the moment. And perhaps, being present in the moment for his family before the race, when he was wiping noses rather than keeping to a strict training regimen, also played a part in his legendary win. He was focusing on doing what he could do, right there in the moment. Speed Concept is pure drag-defying tri performance. It offers total aerodynamic integration, incredible fit, and even Project One customization, all in one incredible system. 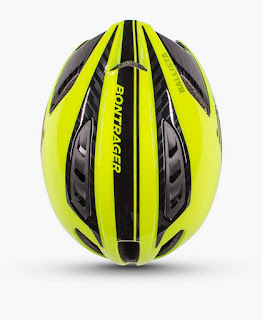 Thanks to a wind tunnel-proven design and superior venting via our unique internal channeling, Ballista launches you to the front of breakaways and sprint-line finishes. 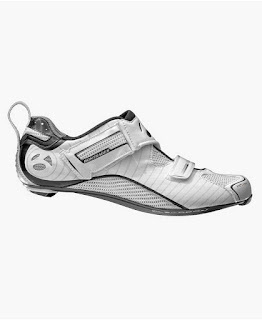 Hilo RXL combines thoughtful tri-specific details like the easy-to-grab heel loop with the proven heritage of Bontrager performance footwear for the quickest, stiffest, most comfortable triathlon shoe ever.